Himalayan Peppergrass is an annual or biennial herb, up to 20-25 cm long, rising up or nearly erect, branched, often spreading, glandular hairy. Lower leaves are pinnately cut, 3-6 cm long, 1-2 cm broad, narrowed into a short stalk or stalkless, with narrow oblong pointed lobes. Upper leaves are pinnately cut or simply toothed, stalkless, smaller, usually not much different from the lower ones. Flowers are borne in 20-30 flowered, dense, congested or head-like racemes, without bracts, hardly increasing up to 3 cm in fruit. 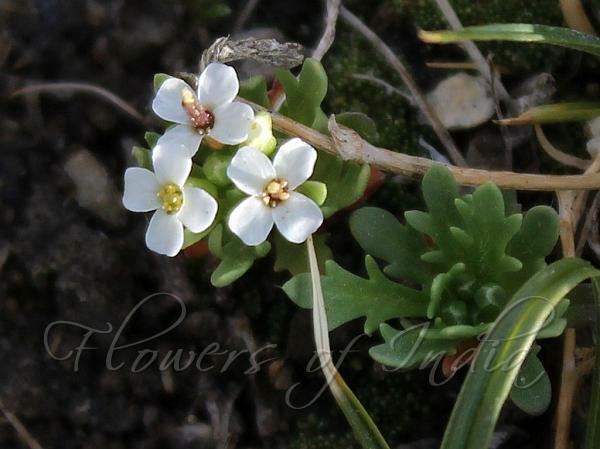 Flowers are white, very small - petals white, obovate, 1.8-2.5 x 1-1.3 mm, tip rounded. Flower-stalks are up to 4 mm long in fruit, thread-like, spreading. Stamens are 4 (outer 2 absent), with minute anthers. Seed-pods are 2.5-3 mm long, about 2.5 mm broad, ovate, slightly notched at the tip with nearly stalkless stigma not exceeding the notch, hairless, obscurely winged at the tip. 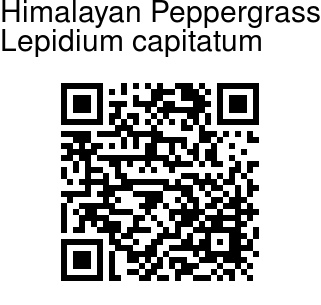 Himalayan Peppergrass is endemic to the Himalayas, from Kashmir, Ladakh to Tibet and Nepal, at altitudes of 3600-5300 m. It is common in Ladakh. Flowering: May-June. Medicinal uses: It is believed to be useful in making post-coital contraceptive. Identification credit: Hussain Barbhuiya, Miroslav Dvorský Photographed near Pangong Lake, Ladakh.